The society has been performing plays regularly since 1948. The Keighley Playhouse performs seven plays each season ranging from comedies to thrillers and from dramas to farces. Season tickets may be bought (seven plays for the price of six) and the bar is open 30 minutes before curtain up at 7.30pm. Beat the queue by ordering your drink for the interval. Tea and biscuits are also on offer and brought to your seat. There are various concessions and special prices for opening night's. Tickets can be booked by telephone on 08451 267 859 in advance or in person at Fletcher's Etc, Cavendish Street, Keighley (two weeks prior to each play). The educational system has come in for a lot of criticism lately so the Keighley Playhouse has gone back to school for their latest production and the pressures of teaching. 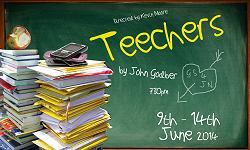 Teechers was written during the 1980s but the subject matter is as relevant today as it was 30 years ago! Basically, there are three types of schools the public school, which is actually an exclusive private school; the private school, which is a high-calibre public school; and the comprehensive school, reserved for those children written off as average. Teenagers trapped in a school full of dull, indifferent teachers have become alienated and recognizing that no one really cares about them, they cling to each other for support. Then along comes a teacher who really understands. He manages to inspire the kids and get them to care about learning. Even though he could make more money somewhere else, he chooses to remain an underpaid, underappreciated teacher; just so he can stay with the kids he admires and respects so much. Tickets are available by calling the box office on 07599 890 769 during office hours. If you would like to be reminded of forthcoming plays/events please email keighleyplayhouse@btinternet.com for further information.